PHOENIX — Smoke from lit bundles of sage swirled around protesters waving signs, “Water Is Life” and “Stand With Standing Rock” to oppose the construction of the Dakota Access Pipeline. Members of the Standing Rock Sioux Tribe and other opponents of the pipeline have been protesting in North Dakota for months, attempting to block construction of the pipeline that would travel through North and South Dakota, Iowa and Illinois and carry 470,000 barrels of crude oil a day, according to a Cronkite News article. 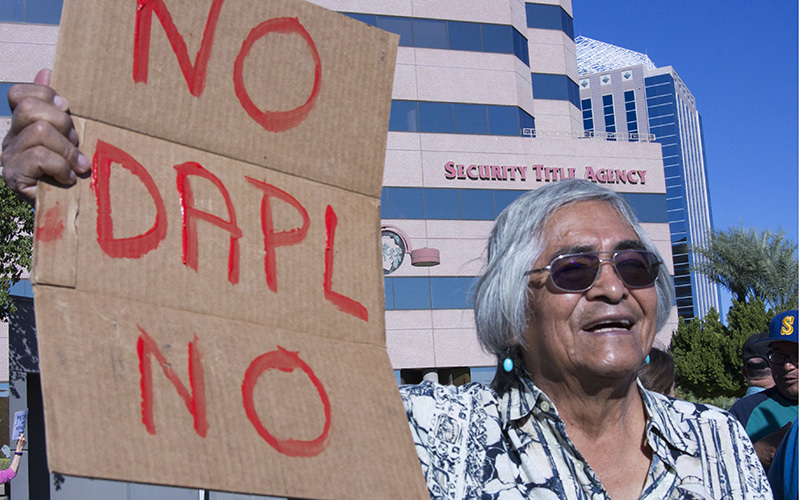 Tribal members fear the pipeline could destroy a vital water source and sacred land. It would travel under the Missouri River at Lake Oahe — near the reservation, according to a Vox article . 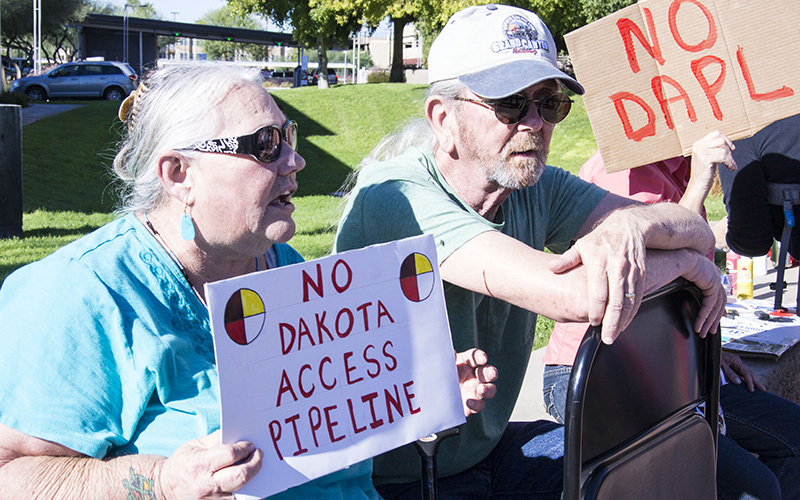 Other opposition arguments are it would increase dependency on fossil fuels, which is believed to contribute to climate change, and continue longstanding government mistreatment of Native Americans, protestors in Phoenix said. Energy Transfer Partners , the company in charge of the pipeline, said it would allow oil to reach markets in a safer, more cost effective manner instead of using train and truck transportation. It would also benefit the United States by using domestic sources of oil and create thousands of jobs, according to the website. The U.S. Army Corps of Engineers stated on Monday that construction near the area must be halted. The corps is asking for additional discussion and analysis regarding the tribe’s concerns. Energy Transfer Partnersreleased statements on Monday and Tuesday denouncing the corps decision. Company officials said the corps already granted them access to build on the land and are now asking for federal court intervention to put an end to all political roadblocks. Here’s a look at four Arizona protesters who stood with Standing Rock on Tuesday. Why he protests: Desert Little Bear said the internet exposes issues to millions of people and keeps social movements strong by giving people a voice. Why she protests: Hall wanted to join the ongoing protest in North Dakota but didn’t have the resources. When she found out about the national protest day, she decided to organize the Phoenix protest outside the U.S. Army Corps of Engineers office in downtown Phoenix on Tuesday. In her own words: “I’m standing up for the human rights that have been violated and want indigenous people to be recognized for who they are,” she said. 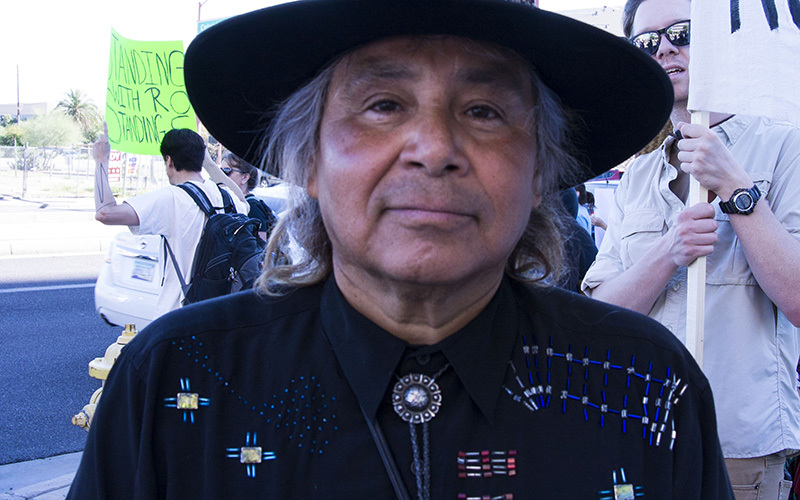 Why he protests: Simon Ortiz gathered protesters to pray, saying the issue should be everyone’s concern because an oil corporation is threatening the water everyone needs to survive. Why they protest: Judy and Lyndon Kessler, wife and husband, sing a Sundance Song with lyrics that translate to, “The water is sacred. 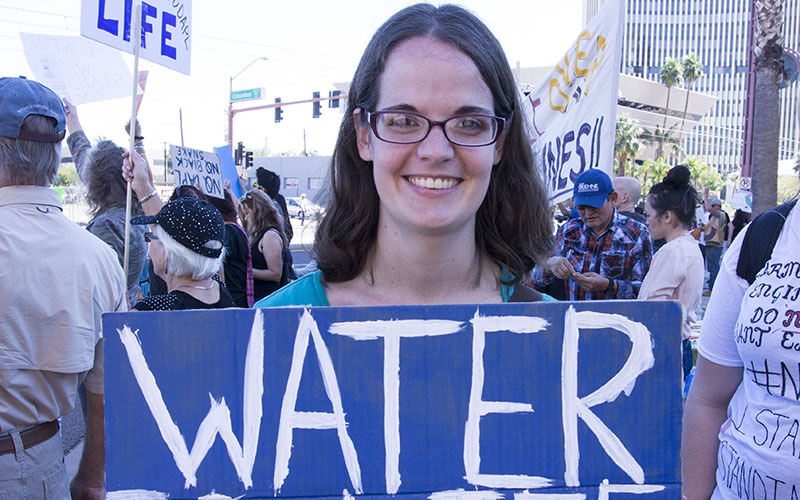 The water is sacred.” Kessler said she couldn’t bear remaining silent.